PVDF structured packing material is not corrosion resistant metal, ceramic filler is not convenient installation and maintenance of the circumstances of a newly developed packing, I had developed a PVC, CPVC, PVDF, PTFE and other special corrosion-resistant materials of the tower disk, distributor, clips, bolts, blister, random packing, PTFE products such as structured packing material.. Plastic Corrugated Plate Packing has the characteristic of excellent acid resistance, large void, little obstruction, low energy consumption, light weight, easy installation and discharge, recycling usage and low operation cost, and it is suitable for devices of low temperature absorption, water washing and dirt elimination. High temperature resistance, anti-alkali & acid. 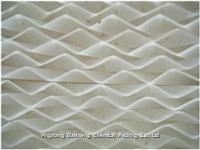 Totally replace the industry corrugated ceramic packing. it is a creative revolution in packing field. 3.According to our clients request, We can design all different material packing .